Jim Cymbala | Pray for Revival! You are currently browsing the category archive for the ‘Jim Cymbala’ category. Are We Becoming More Aware of the Sin in Our Lives? ~ Jim Cymbala, Spirit Rising, 97. What Happens When the Church Prays? Brooklyn Tabernacle’s Jim Cymbala: Do we really believe God can draw anyone to Himself? Have you ever considered the implications of Christ’s startling words when He tells His disciples in John 15:5 “Apart from Me you can do nothing”? Are we really so spiritually helpless that nothing can be accomplished without God? My wife, Carol, and I made that discovery in the autumn of 1971 when the little inner-city New York church I was pastoring was struggling to keep the lights on. Carol and I had frankly admitted to each other that unless God broke through, the Brooklyn Tabernacle was doomed. We couldn’t finesse it along. We couldn’t organize, market and program our way out. The embarrassing truth was that sometimes I didn’t even want to show up for the service. And our weekly Tuesday night prayer meetings were sparsely attended and less than powerful. I remember praying, “Lord, I have no idea how to be a successful pastor. I haven’t been trained. All I know is that Carol and I are working in the middle of New York City, with people dying on every side, overdosing from heroin, consumed by materialism. If the Gospel is so powerful … .” I couldn’t finish the sentence. Quietly but forcefully, I sensed God speaking: If you and your wife will lead My people to pray and call upon My name, you will never lack for something fresh to preach. I will supply all the money that’s needed, both for the church and for your family, and you will never have a building large enough to contain the crowds I will send in response. I knew I had heard from God, even though I hadn’t experienced some strange vision, nothing sensational or peculiar. God was simply focusing on the only answer to our situation—or anybody else’s for that matter. In the weeks that followed, answers to prayer became noticeable. Unsaved relatives and total strangers began to show up. There were junkies, prostitutes and homosexuals. But lost lawyers, business types and bus drivers turned to the Lord there, too. We started to think of ourselves as a “Holy Ghost emergency room” where people in spiritual trauma could be rescued. I knew that a lot of churches gave lip service to the idea that God can do anything. But we needed to have real faith that anyone who walked in, regardless of his or her problems, could become a trophy of God’s grace. The story of our church’s growing dependence on Christ is such a vivid reminder to me of how God uses praying believers to draw the lost to Himself. “I have discovered an astonishing truth. God is attracted to weakness. He can’t resist those who humbly and honestly admit how desperately they need him” (p. 19). Pastor Jim Cymbala of the Brooklyn Tabernacle in Brooklyn, NY, preached a sermon at a praise gathering in Indianapolis in 1994 that is considered one of the most powerful messages delivered on prayer in the last few decades. In this message, he declares that Jesus did not call His house to be one of preaching or worship – but a house of prayer. He challenges believers to get serious about prayer if there is to be hope for a fresh move of God in our churches and nation. He also shares a redeeming story of his daughter returning home as an immediate answer to the prayers of his congregation. As people cried out to God for his wayward daughter, that very night God woke her up and moved in her heart to repent and return home. The very next day, as she knelt before her father and wept over her rebellion, she asked, “Who was praying for me?” The evidence of the Spirit’s conviction in her heart was so profound, and she knew it was in answer to prayer. You can order this popular DVD from brooklyntabernacle.org or view it on online (click here).This is a great resource to share with your prayer team and pastors. It will inspire them to pray with hope and faith! Cymbala leads a Tuesday night prayer gathering at the Brooklyn Tabernacle that often draws more than 2,000 people to what he considers the most important gathering of the week. Many churches have taken teams of people to Brooklyn just to visit this prayer gathering and be inspired toward greater corporate prayer. He is also part of the leadership team of the 6:4 Fellowship, which hosts one-day gatherings for pastors and leaders – with a call to return to the centrality of the Word and prayer. Prayer First is co-sponsoring one of these events in Bloomington, MN, on October 18. More information is below. Prayer First and Converge Worldwide are co-sponsoring a day for pastors, spouses, and ministry leaders with Jim Cymbala, Daniel Henderson, and the 6:4 Fellowship. Mark your calendars for Thursday, October 18, in the Minneapolis, MN, area.You will be encouraged to deepen your ministry focus on prayer and the ministry of the Word. Plan to Stay for Dinner! We will also host a special dinner for pastors with Converge President Jerry Sheveland on the evening of October 18. More information will be coming, but registration for the conference is open at www.64fellowship.com. Will We Pray or Just Be Satisfied With the Status Quo? 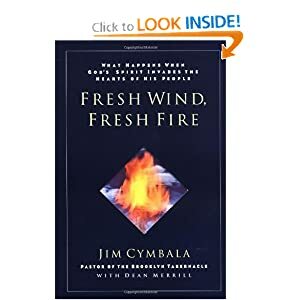 What Happens When We Pray According to Jim Cymbala? If we call upon the Lord, He has promised in His Word to answer, to bring the unsaved to Himself, to pour out His Spirit among us…No matter what I preach or what we claim to believe in our heads, the future will depend upon our times of prayer. (Jim Cymbala, Fresh Wind, Fresh Fire).